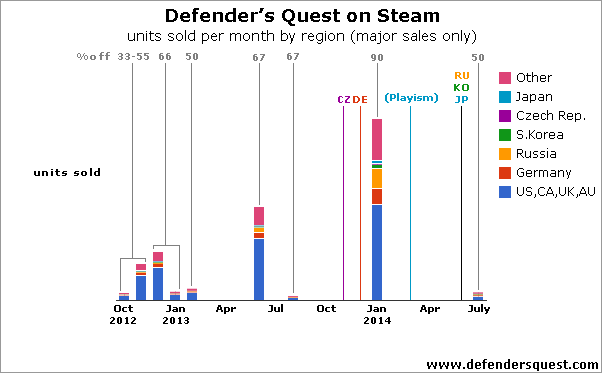 Gamasutra: Lars Doucet's Blog - Was Localizing Defender's Quest Worth It? 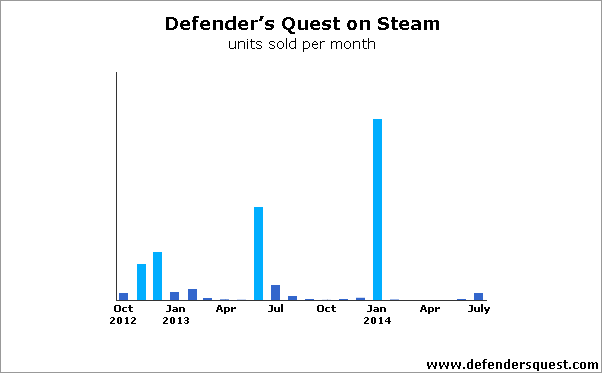 Was Localizing Defender's Quest Worth It? Four massive spikes are responsible for the vast majority of our revenue, which are Launch (33% off), our first Daily Deal (67% off), our Workshop Sale (67% off), and our second Daily Deal (90% off), in that order. Today, Defender's Quest is fully localized for six languages: English, German, Czech, Russian, Korean, and Japanese. Professionals translated German and Japanese, whereas fan volunteers submitted Czech, Russian, and Korean. 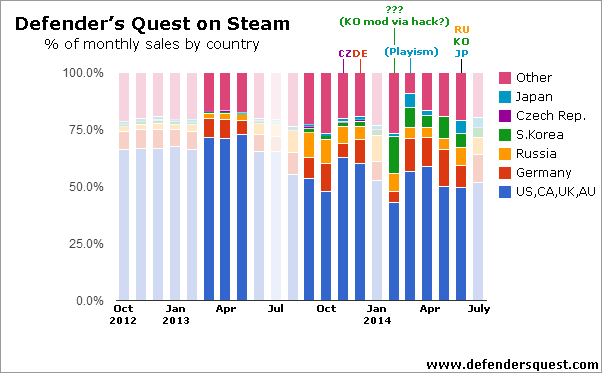 I've marked on the chart when new localizations were added. For instance, the Czech translation was not available until November of 2013, and German came the following month. Two things stand out -- first, a general upward trend in the "non-English1" market (every country that is not America, Canada, the UK, or Australia), and second, sharp increases in the market share of certain countries at specific periods of time. 1Yes, I'm aware that many small countries like Barbados, Singapore, etc, speak English as their primary language, I'm just trying to keep things simple. Were these increases caused by newly available localizations? A perfect scientific study would require data from an alternate universe identical to our own in every way, except for us having had all of our localizations available on day one. But we'll make do with the data we have. The grey numbers up top indicate what % discount was present during any promotions that ran the given month, and the colored letters indicate the points in time when a translation was made available. In the case of Japanese, we launched the Japanese translation exclusively with Playism 90 days before it became available on Steam, but I noticed that many players were manually hacking the translation files into the Steam version. We have seven data points prior to the release of any localizations, and the % market share of each of our languages is pretty constant. There's two noticeable outliers -- June and August. Although they had the same discount, June benefited from from a daily deal promotion, while August only had an unpromoted seasonal sale discount. 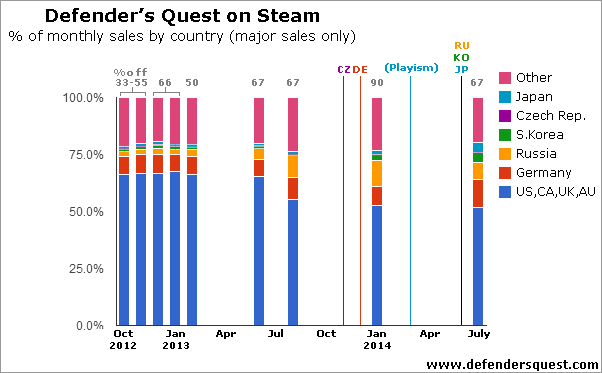 The interesting bit is the orange bar - the % of Russian sales. On average, Russian accounted for 2.48% of the first five months of sales, but in June and August it accounted for 5.1% and 9.8%, respectively. So, before any translations have even been released, we've noticed deep discounts lead to a much higher share of Russian sales. It's hard to say why this didn't happen earlier (we had good discounts in December and January), but perhaps the wide reach of the Daily Deal was what first introduced the game to the Russian audience, who afterwards remembered to watch for a sale. Good news! The market share of every non-English language region increased! German "only" increased by 1.2%, but seeing as that Daily Deal eclipsed all of our prior sales, even a tiny percentage increase makes a huge difference. Czech nearly doubled, although the original market share was very small to begin with. We can probably attribute some or most of this increase to the presence of the new localizations. Yet something else is also going on, because the Japanese, Korean, and Russian regions more than doubled in market share despite having no translation officially available. Perhaps these regions were more price sensitive than the rest, and the big 90% off sale made the difference? In this context, "High price sensitivity" means a given player from that region will hold out for a much higher discount than an average American player would. Steam apparently does lots of research on price sensitivity, and automatically suggests prices for each region. Therefore, we'll use the various prices Steam automatically set for Defender's Quest as rough gauges of price sensitivity. Specifically, wer'e looking at the ratio of the currency value when converted to USD to the standard American price. The only major outlier here is Russia. Everyone else's price is either slightly higher than the American price or lower by no more than a dollar. 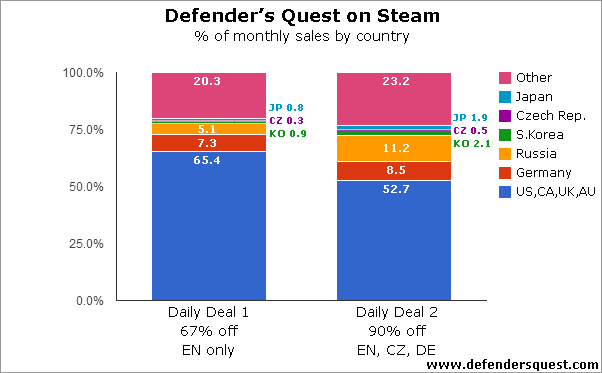 So it's very likely that the second daily deal (90% off) was particularly motivating for Russians, whether it was localized or not. However, we must consider that for at least some Russians a localization might actually have already been available, despite no official support from us! We had added support for Cyrillic fonts around the same time we added the full Czech and German translations, so nothing was stopping enterprising Russian fans from hacking their own localization files into the game. Indeed, long before we officially released a Russian translation, I noticed fully localized Russian-language builds of Defender's Quest cropping up on pirate sites (Russian friends tell me the "pirate translation" was of much lower quality than the fan translation we eventually released). It's entirely possible that Russian Steam players were manually hacking in these "pirate" translations. So a combination of price sensitivity and unofficial DIY translation hacking can explain the bump in Russian. But what about the premature bump in Korean and Japanese? Is this just statistical background noise? Those regions don't seem to be nearly as price sensitive, no translations were available, and even if fans wanted to hack in their own work, at that time the game engine could not display Asian fonts at all. This gives us a bit more context. There was a slight jump in the Japanese and Korean share in January, for which I have no clear explanation, but that small jump is nothing like what follows in February. Look how the green section explodes in size! Granted, monthly sales from February 2014 and after are waaay smaller in absolute terms than what came before, so we're not talking about a huge spike in overall sales. Still, it's clear that Koreans became more interested in the game after this point. What's really nuts is that the official Korean translation was not released until June, so how come market share jumped in February? Well, in February we silently added Korean FONT support to a public opt-in-only beta testing branch. I have strong suspicions that the Korean fan translations were already circulating for some months and players were hacking them in manually; either that or my records are wrong and I had added the Korean fan translation to the beta branch a bit earlier. Regardless, the first big jump in Korean market share coincides with our first useable steps towards Korean language support. As for Japanese, the first big spike in market share comes in March, coinciding with the game's exclusive Japanese-language launch with Playism (who supplied the translation). 90 days later, we unlocked the translation on Steam. Seeing as the Steam version had the same engine as Playism, and the Playism version had a complete set of translation files, it would have been easy for enterprising players to manually hack them into the Steam version. Going back over our steam page, I can see more than a few little "how to" posts like this. Comparing the two biggest sales periods is useful, but let's try the exact opposite approach. This excludes the time periods where promotion and price were a major driving factor, and leaves us with months with compareable sample sizes (between ~100 and 1,000 sales). So, it seems that we have some data that indicates that for the languages we localized for, we saw a measurable increase in market share over time, which we interpret as additional sales we would have not made had the localizations not been available. 1. Have your localizations ready at launch! As I've said before, the game is all about promotion. If you add a cool feature after launch (like localization), and you don't get promotion for it, nobody will notice. Assuming that localization is right for your kind of game, your best bet is to have as many ready at launch as possible. I'm also flabbergasted that Steam doesn't do region-specific promotions; if I were a German player, I'd want to see more games that are available in German. If the long-rumoured Steam redesign addresses this, localization might become a much more lucrative pursuit. Germany was consistently our second-highest earning country, beaten only by the United States. You barely even have to do the math on this one -- if a German localization increases your overall revenue by even 1%, the German market is so big that you'll almost certainly earn your money back on the investment. Just make sure you have lots of room in your text fields. Russia is huge, and given that games make most of their money during (promoted) sales, it makes sense to maximize your appeal to Russians. As with German, the market is so large here that the exact measurable % increase isn't a huge deal -- even a small % gain will mean lots more sales. The data seems to indicate pretty strongly that as soon as font and language support for these languages was added, we started reaching significantly more of them than before. Would have been nice to have had that ready from the start before the first few big sales! It's hard to base localization decisions on regional sales reports from an un-localized game. We got a lot of Norwegian sales, for instance, but I know first-hand (jeg er en nordmann) that Norwegian gamers are quite fluent in English. So even though the Norwegian market is disproportionately large compared to its population, we probably won't see many more sales from a Norwegian localization. On the hand, countries that are the most responsive to localization (ie, the ones who won't buy your game at all without one) probaly don't even show up on your un-localized sales charts. For instance, Spanish-speaking countries rank fairly low on our sales, but I know first-hand (soy hispanohablante) that English fluency is lower in Spanish-speaking countries than in Northern Europe. Given that "EFIGS" is the industry standard, we probably should try French and Spanish at least next time around. Next time around, given enough budget I would seek professional localizations for: German, Russian, French, Spanish, Japanese, and Korean. Chinese and Brazilian Portuguese would go on my "like to have" list. We didn't built the original Defender's Quest with localization in mind, which meant a lot of work jury-rigging proper font support and finding a way to separate all our text information from data and code. Of course, we learned a whole lot from this ordeal, so localizing Defender's Quest II will be much easier -- we've even open-sourced the libraries that embody everything we've learned: Firetongue and Flixel-UI. Before jumping in blindly, make sure you properly assess whether localizing your game even makes sense by analyzing your genre, the amount of text, regional interest, etc. We put a lot of effort into supporting fan translations, but they should not be considered a replacement for professionals. With fan submissions, you have no idea what you might receive and you have no right to expect anything, since those people are generously providing you something out of their free time. My policy was to make it as easy as possible from a technical perspective, offer lots of hands-on support, and be grateful for whatever we received without pressuring anyone to submit anything. I used to do volunteer fan translations myself (I translated a few Norwegian graphic novel series to English, The Knights of Dor and the first few books of Miranda, both by InkaLill Røsberg), so I understand the enthusiastic spirit of these fans. However, I didn't want to be too solicitous, especially because my lawyer insisted that we get full rights to any submitted translations (there's just no other way to do it safely). Fan translations are not entirely "free" by the way -- volunteers often need support, and that takes time and effort. Make sure you uphold your end of the bargain if you're going to accept work from volunteers. In the end, I made a simple promise: if a fan translation arrived at our doorstep, we would put it in the game and credit the author. 8. Was It Worth It?. Out of professional courtesy I'm not going to disclose the price we paid our professional translators, but it's not hard to estimate the "raw" cost of a translation - plenty of professionals will give you a quote if you give them a word count. Defender's Quest had somewhere around ~45,000 words or more. Actually integrating translations comes with a time cost -- I can't put an exact figure on it, but it was a lot, though we'll save a lot of time next time by using our massively improved systems. Just know that German text tends to overflow boundaries, your user interface needs to be responsive and flexible, adjustable per-language font sizes are nearly mandatory, and Asian languages require proper IME support. All in all I would say it was worth it. We broke even for sure on our professional translations and the sunk time, and now we're much better situated to get this thing right on day one with Defender's Quest II.